Canary blenny larvae (Meiacanthus oualanensis) were raised from captive-spawned eggs at 77-79F on rotifers and artemia. The larval duration was 38 days. First record of Canary blenny culture. 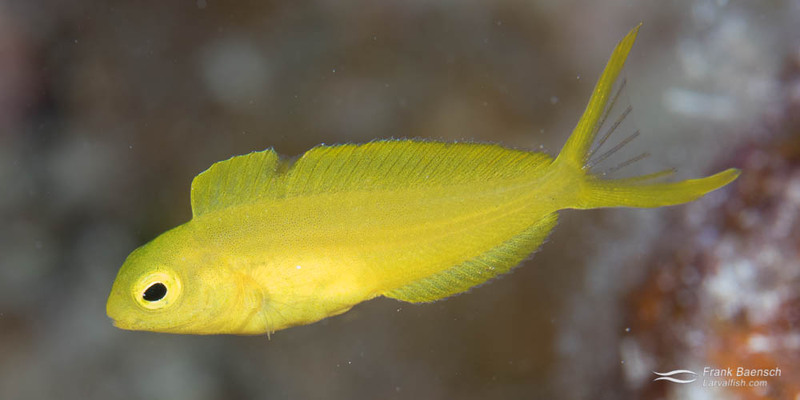 The canary blenny is among the three most popular forktail blennies. It occurs in the Western Pacific, particularly the Fiji Islands, in shallow waters. Because of its small mouth it likes small pieces of soft foods, such as mysid, adult brine shrimp or gel diet. Tanks as small as 20 gallons with some hiding infrastructure are suitable. Water temperature should be kept between 76º and 82º F. Adults reach a size of about 4 inches. Left: Canary Blenny pair (male on bottom) with nest (in pipe). Canary blennies are demersal spawners and lay nests similar to the way damselfishes do. Males are larger than females. My pairs were kept in 20-gallon tanks where they spawned in PVC pipes. Females lay nests anywhere from 100 to 300 eggs. The eggs are reddish-brown, oval and about 1.2 mm in diameter. The male cares for the eggs by protecting and ventilating them. On the evening of the 10th or 11th day they hatch. At this time larvae are able to feed on s-type rotifers. Later stage M. oualanensis larvae rest on the tank bottom at night, only ascending into the water column when the lights are turned on. Metamorphosis begins after 35 days, when the fish starts turning yellow, and is completed by day 38. The larvae can be reared on rotifers and artemia in Tetraselmis greenwater but survival is much better on rotifers and wild plankton. I would consider this fish moderately difficult to culture because of the higher than usual nutritional demands of the larvae.